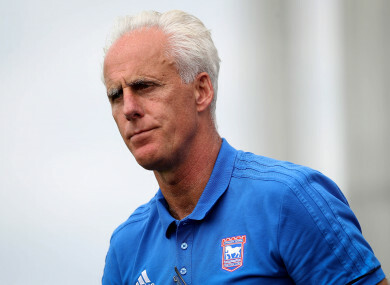 Former Ipswich Town boss Mick McCarthy. TONY CASCARINO HAS backed Mick McCarthy to take over from Martin O’Neill as Republic of Ireland manager. Derry native O’Neill stepped down from his role this morning by mutual consent, with ex-Ipswich boss McCarthy and Dundalk manager Stephen Kenny considered the frontrunners to replace him. McCarthy, 59, previously managed Ireland for six years, leading the team to the Round of 16 in the 2002 World Cup in Korea and Japan. “I think Mick is ready for international management again,” former Ireland striker Cascarino told talkSPORT earlier today. “I know Mick and I think he did a really good job in 2002, I was there when he got the job. “With all the issues and challenges he had to face, because when he took the job we had an old squad. “He had to get rid of a number of older players, whether they retired or he fazed them out, and he did that brilliantly well. “I think there’s a lot to be said from that. Email “Cascarino: 'I think Mick McCarthy is ready for international management again'”. Feedback on “Cascarino: 'I think Mick McCarthy is ready for international management again'”.